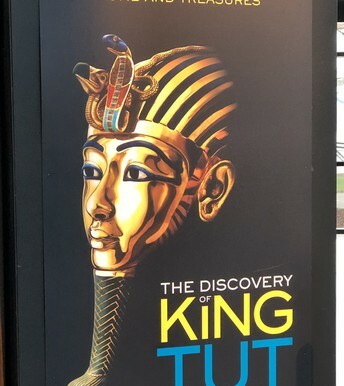 Nearly 400 seventh graders discovered the mystery and awe of ancient Egypt, thanks to the fall fundraising effort of the Cedar Park community. 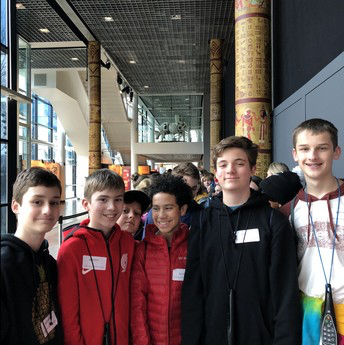 Students and chaperones braved the MAX and headed to OMSI this January for a fun-filled day of science exhibits, OMSI's current Egyptian history exhibit, and a documentary at OMSI's Empirical Theater. 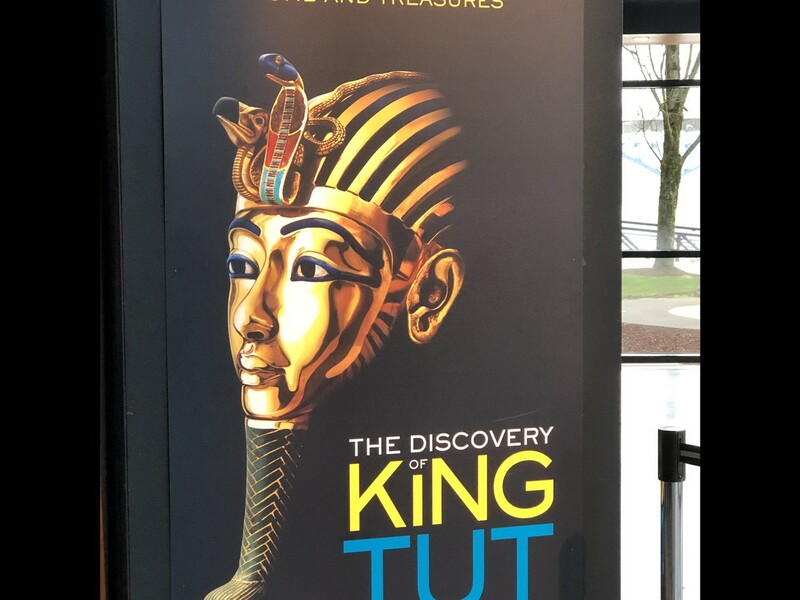 These exhibition fit in nicely with the 7th grade ancient civilizations unit. Massive thanks to all who donated to our 5K effort that made this opportunity possible. Another shout out is due to the over 50 community volunteers that turned out to chaperone our angelic minions. 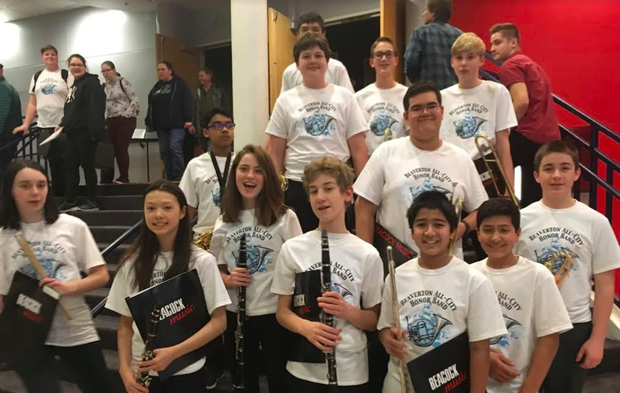 13 Cedar Park 8th graders participated in the District Honor Band on Jan. 11 and 12. These students were selected through an audition process and got to work with a guest conductor for two days with a culminating performance. Bravo to our awesome musicians! 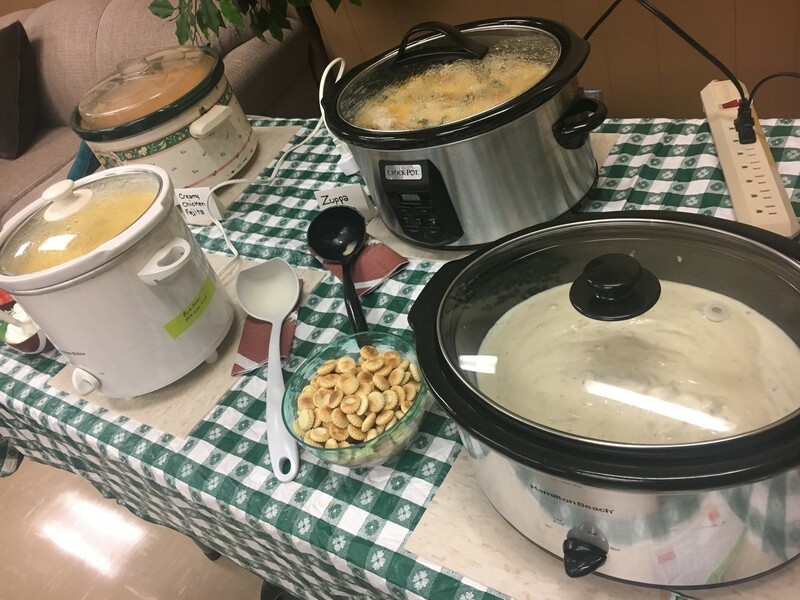 Huge thanks to the Cedar Park community who contributed to yesterday's Staff Souper Bowl, as well as to Staff Appreciation chair, Carrie Fox. 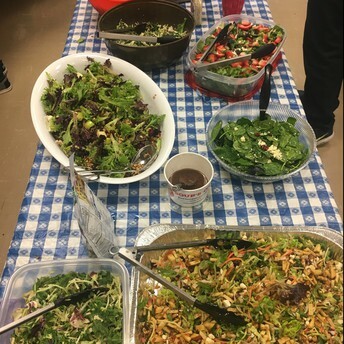 The staff was super jazzed to see this generous buffet of soup, salads, and bread. 8th grader Emery F. (center) has won the CPMS Geo Bee and will be advancing to the Regional Geography Bee. Congrats to Emery & all our finalists! Our cafeteria is one of the last spaces in the school receiving a fresh coat of paint! Out with the red and in with the blue as we transition the colors to reflect Cedar Park spirit colors: orange and blue. 8th grade Humanities teacher, Trisha Parks, has been diligently sprucing up our schools hallways with college pennants from colleges within Oregon and neighboring states. 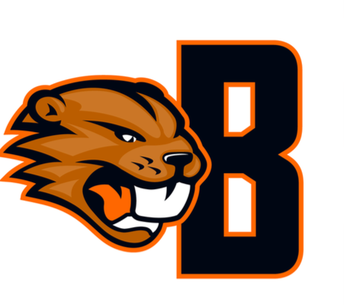 Post high school success is the overall goal for the Beaverton School District. Students are engaged and curious about the various post-secondary education options available to them. Ms. 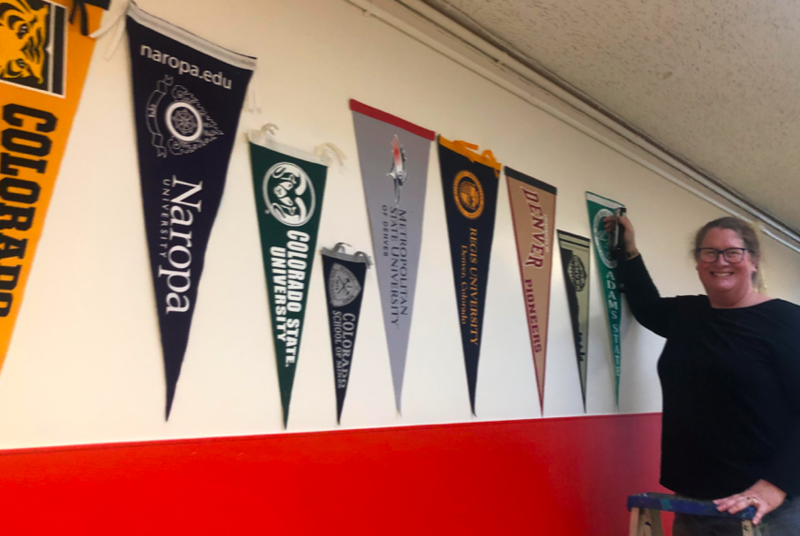 Parks has organized most of the pennants by state, creating excellent displays throughout our halls. THANK YOU, Ms. 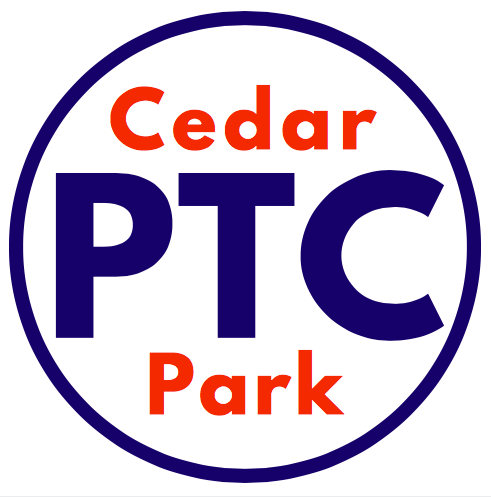 Parks, for keeping Cedar Park awesome! 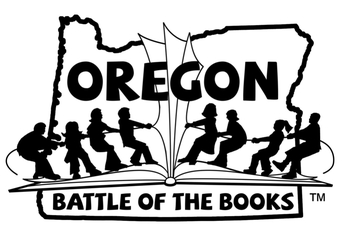 The Oregon Battle of the Books tournament takes off at Cedar Park on Thursday, 2/7. Volunteers will be needed to moderate the battles. Look for a sign-up soon via mVP. Also, the Scholastic Book Fair will be back at the end of February. 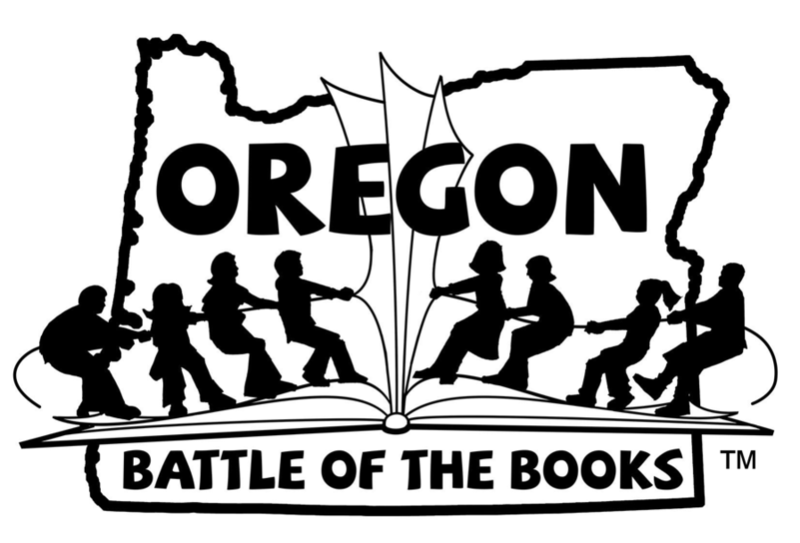 These book fairs are an excellent and easy way to not only put quality books into our child's hands (and off Fortnite & Instagram), but helps fund additional library purchases to update our collection. Be on the lookout for more information, as well as volunteer sign-ups coming soon. Library media assistant, Debbie Hernandez, continues to make relevant, beautiful displays throughout the Cedar Park library. Debbie selects books to accompany her displays. 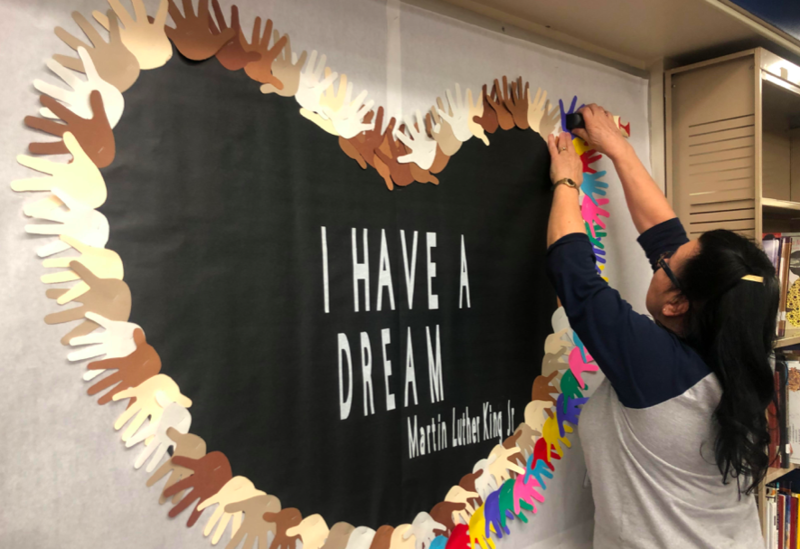 Her current display is a tribute to Martin Luther King Jr., which will remain on display through the end of February. The display is accompanied with books and information about the civil rights movement and Black History Month. THANK YOU, Ms. Hernandez, for creating beautiful and rich spaces for our students to learn. Cedar Park will host the first of two student socials of the school year on Friday, 2/15. Each grade will have a separate celebration. CPMS staff work hard to plan and organize this event. 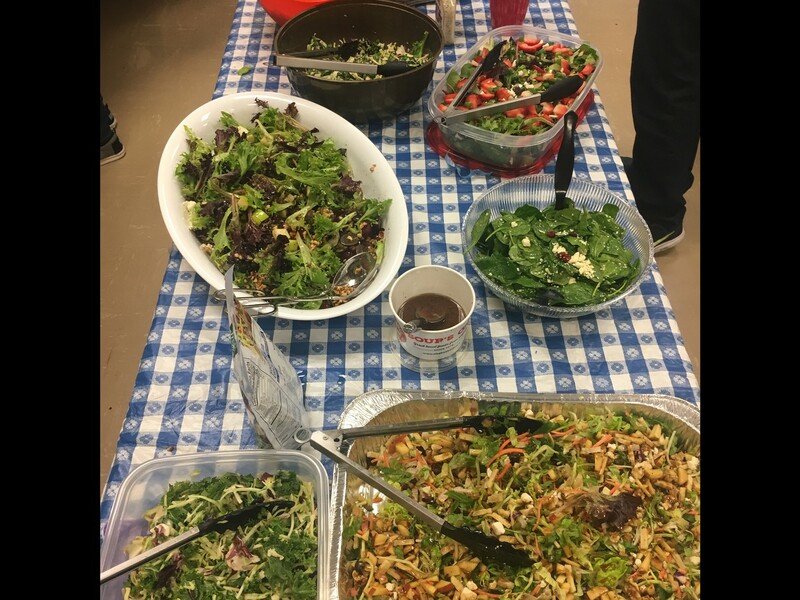 Past socials have included a DJ, food/snacks, a photo booth, and various stations throughout the building for students to choose from. Parent involvement is a MUST to ensure a safe, fun, and awesome event. Look for volunteer shifts soon via mVP. This popular event is a perfect way to spy on, errr.... witness your child's social circle. The Unity and Diversity Club is open to new members. 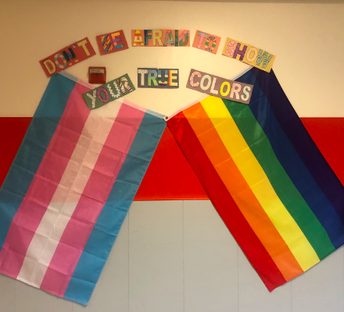 CPMS counselor, Rachel Taleff, has been organizing the group focusing on student inclusion and support, students who identify as being apart of the LGBTQ+ community and allies of the community are more than welcome to participate. Last spring, the PTC held over some PTC funds to construct a new and improved Cedar Park sign. We would like to put a committee together to get the project going. Maybe a group of 8th grade students and parents can work together for an 8th grade gift to the school? Boy Scout Troop project? Any ideas are welcome. Contact PTC President, Jana Drotzmann at janadrotzmann@comcast.net. Used Board Games Not Sparking Joy? Donate to CPMS! 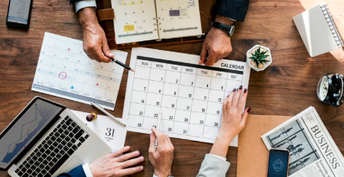 CPMS dedicates one advisory period each month specifically to connect with kids, and board games are an excellent way to make that happen. 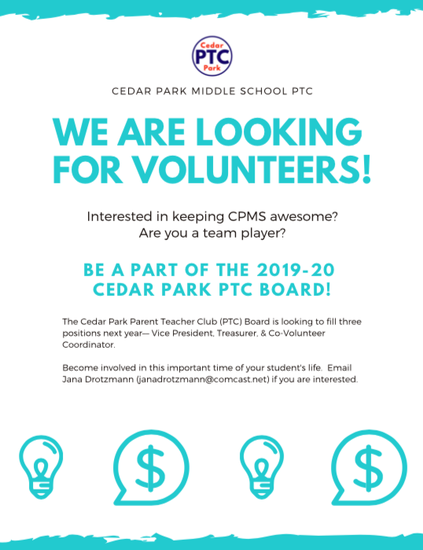 This winter, Cedar Park is asking you to clean out your hall closets and search your basements for family friendly games to donate to CPMS. 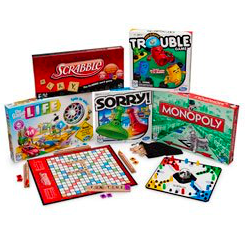 Think Jenga, Operation, Uno, Sorry - you know, the classic games you remember playing as a kid. Please donate your gently used or new games to our front office; we'll make sure they all get a home. Don't forget to ask your students about game days in Advisory! Join Cedar Park administrators and your PTC Board to hear news, updates, and budget info. Learn more about Cedar Park and the valuable PTC component, while meeting your fellow parents. 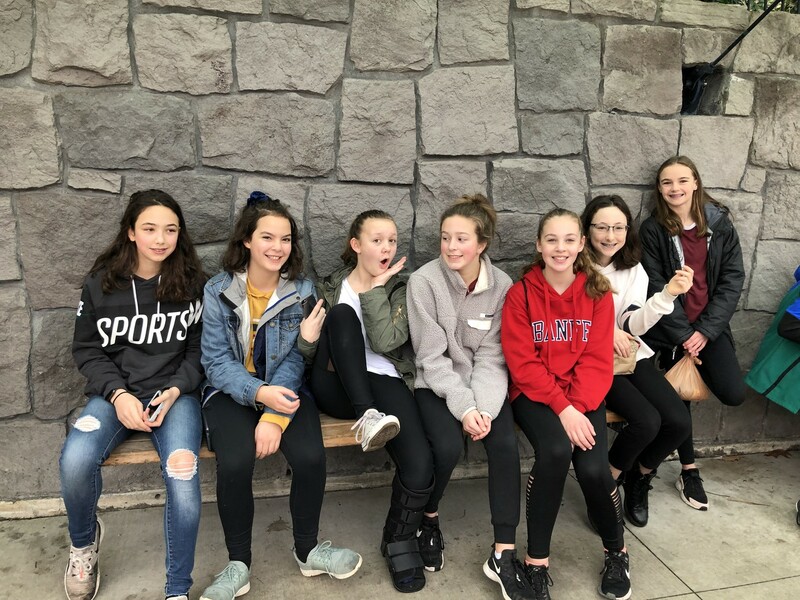 UPDATED 2/1: CPMS' resident theater company, Cedar Park Onstage, will be presenting a One Act Festival on Friday, 2/15 at 7pm here at CPMS. 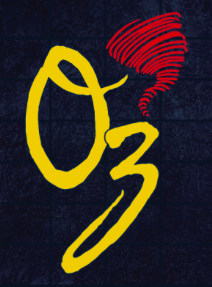 This event will include two one-act plays– Oz and The Firecracker Incident by Don Zolidis. 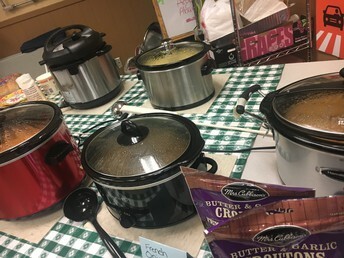 Don't miss this exciting chance to support Cedar Park students! 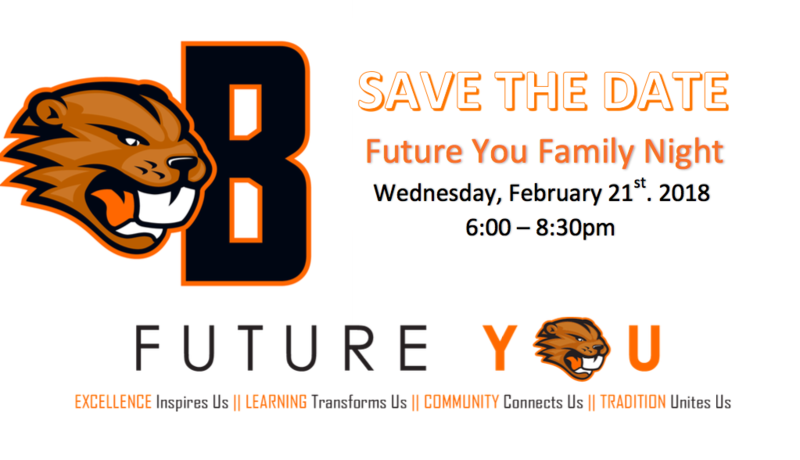 SAVE THE DATE for Beaverton High School's "Future You" Family Night on Thursday, February 21st. This is an evening filled with informative sessions to help families of current 9th, 10th, and 11th grade students with the selection of classes for next year. Look for more information to come. 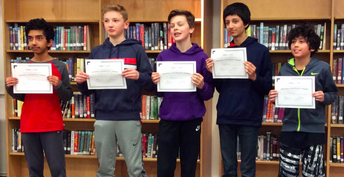 In February 2019, Cedar Park Middle School's Wolfpack Partners will be taking the chilly POLAR PLUNGE into the Columbia River to support the 14,000+ participants of Special Olympics Oregon (SOOR). Each year the athletes of SOOR train and compete their hardest, giving it their all, and being brave in the attempt. We invite you to support us or join our team and help the Portland Polar Plunge reach its goal. It’s a chilly job but someone has to do it! 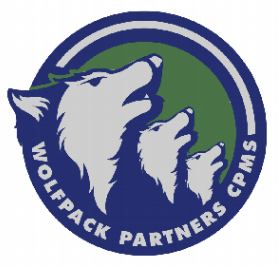 The Wolfpack Partners are an official Unified Club that is supported by Special Olympics Oregon, 50% of your donation will go to support Special Olympics Oregon's great work and the other 50% of your donation will come back to the Wolfpack Partners!!! The students plan to use these funds to promote respect and inclusivity at Cedar Park!!! 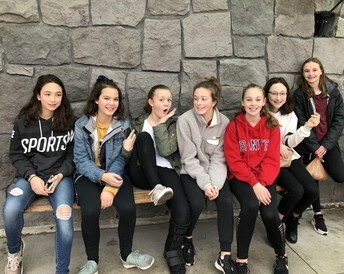 Join the movement by simply donating or joining the team at the CPMS Polar Plunge fundraising page.